Add this guy as well cause cut af. Ante la inminente revelación de un secreto del pasado, la guerrera Feng Zhiwei tiene que elegir entre la venganza y su lealtad hacia Ning Yi, el príncipe . @Lina Hu glad I am not the only one who has to watch at least 3 times to finally get the gist of the story. I'm getting into the story after watching episode 2. It's pretty political heavy with all the scheming and faking. But the meeting of Ning Yi and Feng Ziwei is pretty funny and interesting. For now, I'm sold on the story. Side note: I just wish they have better costume designer. Someone commented this on Cfensi’s post but I guess the wide torso look was partly influenced by Japanese historical attire. The women attire also looks like it was influenced a bit by Tang Dynasty attire but I don’t know. The story is getting interesting!! Now I'm glad that it's airing everyday! Found this recap of episode 1 and 2 online. It’s not airing on Netflix US right now. Might be picked up after it finishes its run but who knows. Thanks for sharing this. Now at least we know what all is happening. I kind of guessed they were talking of marriage between FZW and Chu Wang...but the weaver background and everything was confusing me...so it's clear now that's his cover when he was under house arrest. Like the recapper, I too found Chen kun a bit over the top in his faking idiot scenes but he's excellent in his serious and scheming scenes....I also like his scenes with FZW after she finds out who he is. I think I might try watching the raws now after reading this....will be just a little easier to follow the story at least. The 1st episode was really hard. I hope the days of him faking aloofness will be over soon although it's gonna get serious and angst once he stop faking it. I think major angst will start once FZW finds out her true identity....till then we can look forward to her growth as a talented official and her political sparrings with Chu Wang along her growing feelings for him. I'm not sure about him though...whether he really falls for her or he uses her feelings for him to his advantage and later realises he loves her after loosing her. Coz in the trailers he does not look happy even after hes achieved his goal...the throne. I can confirm for sure. It's gonna be full of angst! Whereby he was looking at her deeply while they were at the mountain or looking at some scene and he changed the look on his face when she looked at him. That I feel.. he had fallen for her but his goals and what's not seem to have stop him. Angst. What have I gotten myself into this time? I saw the first four episodes and I can’t comment anything on the storyline because I don’t speak Chinese. The visuals are amazing honestly, especially the female attire and the set when the princes were meeting up. This show has a darker vibe, similar to T&E, and the cinematography does it justice. I can also feel the slight hint of angst that’s building up. I like how the meeting between the leads went and their interactions later on, slightly feeling the sparks through this thick language barrier. It went pretty smoothly, and I like that because I’m not a big fan of misunderstandings (like she thinks he’s a pervert or a jerk) or they start out as enemies. While I didn’t understand what they were talking about, I smiled when the usual comedic sound of plucking strings came out. I also particularly liked the shot of Ning Yi walking with his guard, up to the palace with a servant holding a lantern ahead. I don’t know why but I like the color palette they chose in that scene, darker shades of blue instead of shades of black against the light from the lantern. It contrasted better and looks prettier too. And it’s also one of those minimalistic settings where you can understand the feelings of a character (not this shot) just from how the camera moves. Now, I found the baby scene odd because he just threw it? And the way he was falling down the cliff too. The black and white filter they had going on felt like a sore thumb and it looked a bit weird to me. Same thing with FZW at the pavilion during the nighttime. It somehow looked awkward to me lmao. One thing that worries me is the use of flashbacks, especially in the fourth episode. This was a huge problem in T&E, you know, flashback to that scene we saw like five minutes ago. And I see people, for lack of a better word, compare this show to T&E because of the number of episodes. I’m still looking on the bright side though, because it only released four episodes so far, so I’m not feeling too worrisome. T&E had some issues during its production but it looks like everything went smoothly for TRoP and that’s good. Sidenote: this isn’t because I stan Ni Ni, but she looks A.M.A.Z.I.N.G. Chen Kun with his long hair too. Just wondering if this drama is based from a novel. Is it going to be happy ending? apparently its 90% different from novel. So he does fall for her but his ambition makes him push her away...theres another scene of him secretly looking at her and then hiding when she, standing in the middle of the street, realizes he's there....that scene seems like she's leaving the country or something. @dito I like your optimism. I'm a big spoiler addict myself.....I even check out the endings to mystery novels....I don't want to invest my time into something I might end up hating coz of few pages of climax. Sometimes it ends up being a huge mistake. I read Princess Weiyoung before the drama aired and liked it a lot....I've never seen a female lead that ruthless. But when I saw the drama I couldn't accept the changes and gave it up. Sometimes it doesn't matter if the book had an happy ending or sad...the drama version can still screw everything up... e.g Princess Agents. Some dramas do angst so good that you don't care about the end...its the journey that interests you....like NIF...you knew in first 15 mins of ep 1..that main lead is going to die soon....but you still followed his journey til the end to see him accomplish his goals....to see him win....maybe thats the case for this drama too...for me....at least for now. Though I don't want to compare but the start of this drama gave me big NIF feels....the flashback to the past...the waking up from the nightmare.....the music....the lighting...very much reminds me of NIF....which is understandable because I think some of the Production team of NIF was involved in the making of this drama too....correct me if I'm wrong. 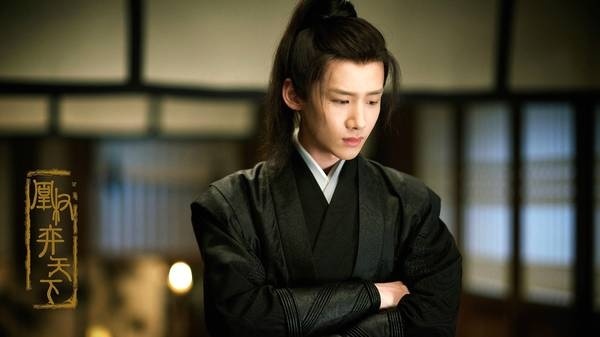 I think Ning Yi and Ye Hua have some of the best hair in all the chinese dramas I've seen. Makes me seriously envious of their straight and silky, flowing hair.